The long history of ikebana can be traced back as early as the sixth century with the introduction of Buddhism to Japan from China and Korea. Buddhist floral offerings, called kuge, were placed on the altar of temples. The offering consisted of three main stems gathered closely at the base and rose from the water as one. The three stems were used to represent the harmonious relationship between heaven, man, and earth. For hundreds of years, priests continued to make floral offerings to Buddha, but there were no set rules used to make the arrangements. Ikenobo Senkei, a Buddhist priest, created the earliest form of ikebana, called tatehana, or “standing flowers.” The arrangements were meant to be displayed in the tokonoma, a recessed area in a traditional Japanese home used to display art objects. The tokonoma was a central feature of the new Shoin architectural style. It was after ikebana began to be displayed in the homes of the aristocracy that its purpose changed from that of a religious offering to that of a decoration of the home. The ikebana was displayed alongside valuable artworks and hanging scrolls. A harmony among the objects being displayed in the tokonoma was part of the beauty of the space. Therefore, the design of the ikebana became important. The objects displayed would change to reflect the season, which lead to the use of seasonal flowers in the arrangements on display. Because of this, ikebana began to be appreciated as an art form. In the sixteenth century, the tatehana style became to be systematized as rikka, or “standing arrangement.” Each stem in the arrangement has a symbolic meaning drawn from both religion and landscape art. The whole arrangement became a kind of microcosm representing the entire universe. These tall, formal arrangements became very popular with the ruling Shogun. Noblemen, priests, and even samurai warriors became very adept at making grand arrangements. During this time, another style was also gaining popularity. The drinking of tea had been introduced from China, and Zen priests began to develop the ritual and its aesthetic simplicity. The rikka arrangements were grand and imposing arrangements and would not fit well into the simplistic tea ceremony ritual. Chabana, or flowers for the tea ceremony, were a more informal style, often only using a single seasonal flower or branch to capture the essence of the material. Along with chabana, nageire became popular with both the merchant class and the general public. Nageire, literally “to throw in,” is a free-style form usually done in a tall vase. There were no set rules for the arrangement, and it could be used to decorate any space. An emphasis on the natural form of the flowers played an important role in nageire. Then, during the Edo period (1600-1867), a new form of nageire became popular with the rising merchant class. The wealthy merchants wanted a style of ikebana that was easier to learn than rikka. The new style, called shoka, was derived from the three principal stems of rikka. The three branches representing heaven, man, and earth formed an asymmetrical triangular shape. It used fewer materials than rikka, showing the influence of nageire, but kept some of the formality of the style. It was easy to do and spread quickly throughout all classes of society. And for the first time, women were also encouraged to practice ikebana. The Edo period also saw the rise of different schools of ikebana. Individual masters would hold exhibitions to show off their skills and attract students. They set up systems to rank students and issue certificates for those qualified to teach. In addition to Ikenobo, usually considered the oldest school, Enshu, Misho, and Koryu schools gained many followers during the eighteenth and nineteenth centuries. For over 250 years, Japan had cut itself off from contact with the outside world. Because of this, many traditional arts reached a peak of extraordinary refinement and maturity. But, it was followed by a time of stagnation. Then, in 1867, when America sent trade ships to Japan for the first time, the doors of the outside world were opened to Japan. New ideas and culture flooded into the country. Many of these foreign ideas were considered civilized and enlightened and were quickly absorbed into the Japanese culture. Western-style clothes and interiors became fashionable and many new materials – species of flowers and plants from the West that Japanese had never seen before – inundated the country. 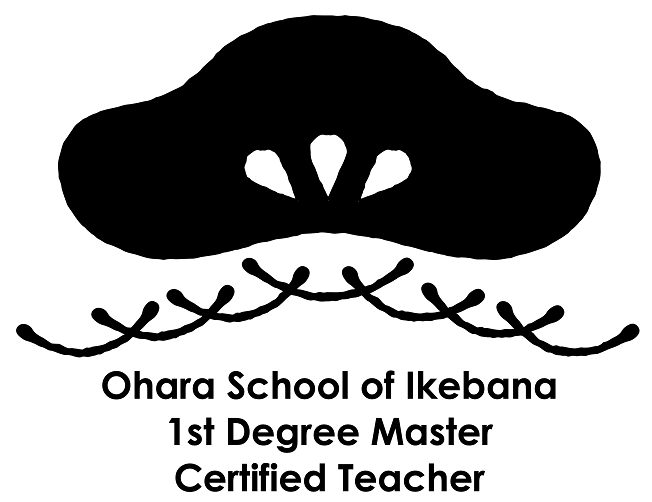 In 1895, Unshin Ohara founded the Ohara School. He created a new style of ikebana to make use of the new materials coming into Japan. The new style called moribana, literally “pilled up flowers,” used a new type of container and way of arranging the flowers. The flowers were arranged in a low, wide tray-like container called a suiban, and were arranged over a plane instead of the traditional way of all the materials being arranged tightly at a single point. This new style shocked the ikebana establishment, but was eventually accepted by the other main schools and was taught alongside nageirei and rikka. Currently, there are over 3,000 different schools of ikebana. Ikenobo, Sogetsu, and Ohara are the three most popular. Ikenobo is the oldest of the three and still retains the classical concepts of ikebana. Sogetsu is the most modern and emphasizes self-expression. Ohara relies on tradition, but also pays special attention to each season and flower to bring out its natural beauty, creating a modern interpretation of the classical forms. A tradition over 600 years old, ikebana is still alive and well. The different forms and styles of ikebana strive to harmonize with the contemporary spaces where people live, work and play. Arrangements make use of natural materials, bringing the beauty of nature indoors. The tradition has evolved into a modern art from that can be enjoyed by everyone.